For more than 70 years, ACMH has developed innovative solutions for special containers. Three main techniques have been developed: deployable shelter systems, containers for satellites or parts of spacecraft, and missiles containers. Operating from Africa to Siberia, and on both land and sea, our containers have proved their reliability. ACMH is certified to ISO 9001 standards. ACMH has developed refrigerated autonomous containers with a capacity of 1.5m³, 5m³ or 15m³. Each volume is adapted to the needs of our clients. The smallest is designed for the battlefield front line, or a small unit (around 30 people). It is air-transportable, with an aluminium structure. Our biggest refrigerated autonomous container is, at 20ft, of ISO container dimensions. It is adapted to bigger units (about 500 people). 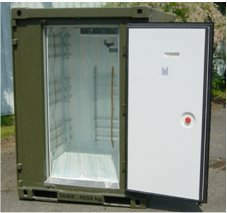 It can be designed with one of our two chambers (freezer and deep freezer). ACMH’s refrigerated autonomous containers are designed to operate under harsh environmental conditions (-20°C to +55°C). They are autonomous, due to their own diesel generator, but can also use a standard 430V-50Hz power supply. These refrigerated autonomous containers conform to the most demanding hygienic requirements. ACMH produces containerised field kitchens or bakeries for 120 to 700 people. Adapted for use in camps, the kitchens have their own diesel generator for cooking and hot water preparation. Gas versions are also available. The biggest kitchen can be deployed in only two hours by four people, and offers catering facilities for 700 people. 70m² of hygienic spacework are allocated to a preparation area, production area, and a distribution and dishwashing unit. 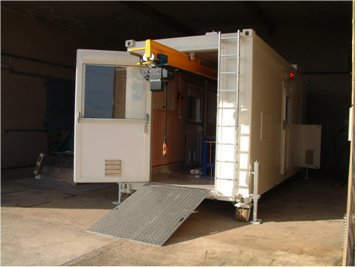 For mobility reasons, the kitchen is packed in two deployable shelters of 20ft ISO container dimension, which are CSC certified, and fitted with STANAG or ISO hook lift. Using a four-container shelter system, ACHM supplied the French Army with a field bakery for 10,000 people. These large-capacity units are particularly appreciated for big camps or in case of humanitarian crises. The military water-tank container is a part of a drinkable water-supply chain. It can maintain and supply water in drinkable conditions. Its capacity is 4,000L. The tank is fitted with a pump, active carbon-filter, clor dispenser and a suitcase-laboratory to check water quality. The tank has strong thermal insulation. During cold weather, the tank and pipes can be heated by a hot-air generator, avoiding freezing. The tank has a height of 2,150mm, is available for use on full (20ft), ½ and ⅓ size ISO containers, and is able to be transported by plane. The pyrotechnical workshop was created to offer adapted workspace and facilities for the maintenance and repair of ammunitions, missiles and fuses. The workshop is equipped with adapted cranes (inside and outside), an air compressor and tools to handle the ammunitions. Interior air is strictly controlled. A central area offers a work space calculated to retain a missile if its propulsion turns on accidentally. 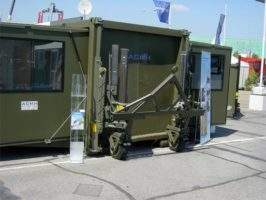 ACMH has the capability to customise a deployable military shelter to your specific system requirements. The majority of these deployable military shelters are designed, manufactured and tested in accordance with ISO 1496/1, and are CSC certified. ACMH designed and manufactured the telecommunication shelter for the NATO communication network in Afghanistan. ACMH developed a general purpose 3/1 deployable shelter with an exceptional floor-surface capacity of 34m², all at the same level. 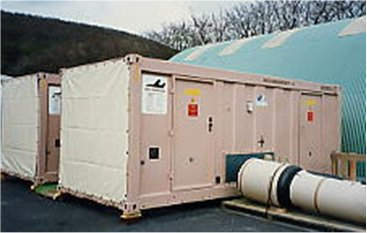 The shelter is thermo-insulated and equipped with STANAG or ISO hook lift. ACMH was recently chosen as supplier for the French Army 's radar shelters .